SNOHOMISH, WA: Big Trees Inc. (http://bigtreesupply.com), a large tree nursery in the Seattle area, recently participated in the protection and transplanting of a very old type of tree, a Camellia. The tree was in the way of a demolition and building project and would have been destroyed, but it has been safely relocated to another part of the property and will continue to provide shade and blooms for many years to come. Big Trees Supply was approached by a builder in January who wanted to start demolition on a property in order to make way for a new construction project. However, the problem was that there was a 20’ tall Camellia tree that has been growing next to the foundation of a house on the property, and is estimated to be 40+ years old. 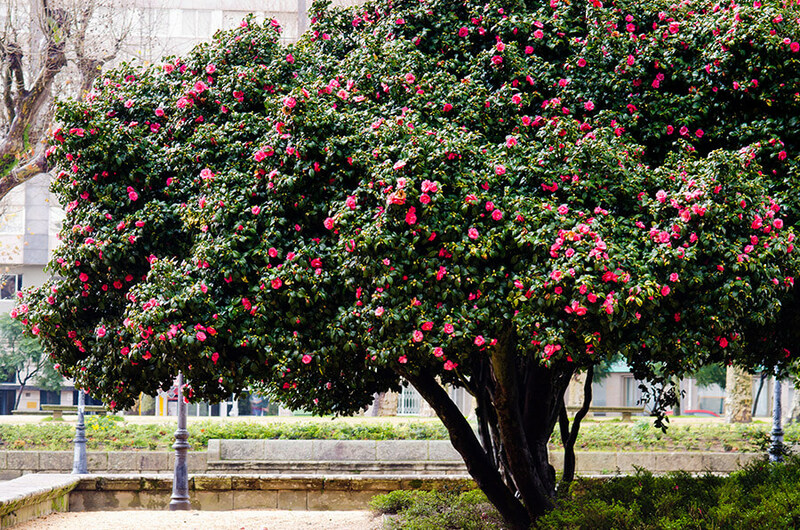 The new owner of the property was reluctant to destroy the Camellia tree due to the building project, and asked their contractor to look into the possibility of having the tree transplanted to another part of the property. The contractor contacted Big Trees, and in spite of the tight timeline, Big Trees began discussions of what could be done to save the tree by transplanting it to a new location. It became clear to the Big Trees staff that the Camellia tree was very close to the home’s foundation, and that the entire house, including the foundation wall, would have to be carefully dismantled and pulled away from the Camellia if it would have a chance of getting dug out and root balled correctly. The day for the project was coordinated with the demolition contractor. Once the root ball was tightly wrapped in a well-built system of plastic wrap, burlap, and rope, the crew fastened and rigged the tree to large excavator on-site and lifted and moved the tree to its new home on another part of the property.